Whenever someone asks about my passions, I promptly tell them ‘Wildlife’, ‘Mountain cycling’, ‘Photography’, topped by my unfaltering love for ‘Environment Engineering’. But most of the times, I suppress my passion for visiting museums. In the past, I used to flaunt my love for museums quite unabashedly but then I saw people’s shocked expressions which screamed out ‘but how come a 20-something boy like you love museums? Museums are only for children, you see’! So when, along with my travel buddies I was chalking out the itinerary of Jaipur trip; paying a visit to the famous Albert Hall Museum was a de facto choice. It also helped that I have got a bunch of like-minded travel companions. One fine morning around 9 am, we headed to this interesting piece of Indo-Saracenic (or Gothic) architecture. The magnificent building of Albert Hall Museum looked almost magical in the vivid sunrays. What struck foremost about Albert Hall Museum were the squeaky cleanliness and the neat maintenance visible in it as I had visited plenty of museums in various parts of India and most of the time; it broke my heart to see their dwindling conditions. It was nice to notice that with such meager entry fees (Rs.20 for Indians and Rs.150 for foreigners), the staff here made it possible to keep this museum running. As always I had done homework beforehand about it and came to know that at least 1 hour is needed to visit this, though the museum remains open from 9am-5pm. I observed that majority of the fellow-visitors were appreciating most- the blue pottery, the miniature paintings and the arms and armors. But what caught my attention was the mummy from Egypt bought by one of the Maharajas of Jaipur. 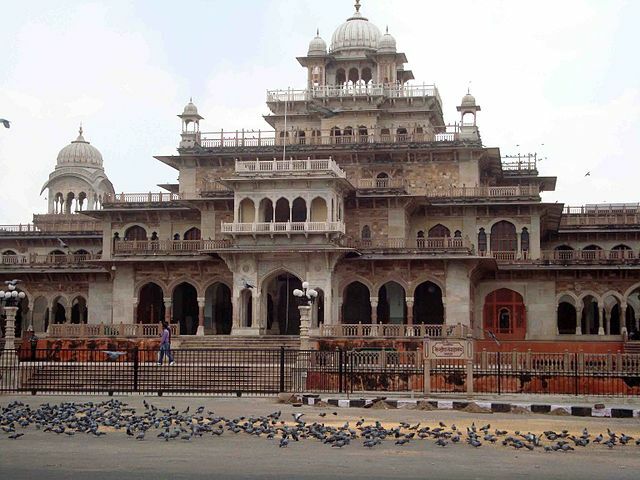 Not only for its display items but Albert Museum is also famous for its rich history that shows the foundation stone was laid in honor of Kind Albert Edward, who visited the city of Jaipur in 1876. With its elegant pillars and archways, vast Indian as well as international collections- this museum seemed the right place to lose myself in history and I simply did that!